The news about Apache Harmony project that brought a lot of traffic to the net, reminded me of the GNU Harmony project which is part of history now. Will Apache Harmony succeed to force Sun to adapt to Apache's license too, like GNU did with Qt? ESR's Let Java Go letter from early 2004 is interesting. A few years ago, I was asked by a friend to implement the Iranian calendar for Java. I had a look at the Calendar and GregorianCalendar classes, and it turned out, the whole Calendar class is using a timestamp member variable which is key to the functionality of the class, but unfortunately the timestamp is not protected. It was in the default (package) scope, which meant that for my IranianCalendar class to work, it needed to be in the same package. I wrote the code that worked this way, but then the Calendar class is in the java.util package, and the Sun JVM does not let you put your classes in the java.util package. I was simply stuck. I handed in the code and told them to duplicate the Calendar class in a package of their own. As for the GNOME 3 discussion, seems like GNOME wants to get out of the 2.x syndrome finally. Linux is stuck in 2.6 for now, and Python is making 3 more of a dream. I think GNOME 3 should simply be 2.x with Cairo and XCompose integrated, language wars settled, Evince finished, and Beagle landed. Found this Alan Cooper's Homonym List interesting. 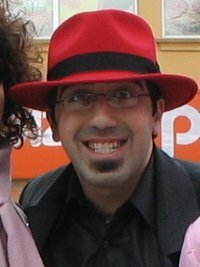 Name a GNOME hacker with first and last names both homonyms. Thanks to Miguel I found Ulrich Drepper's blog too. Found the long paper in this post of him about how to write shared libraries useful. If you want to get an in depth tour on how shared libraries are implemented in ELF, that's for you. Another social problem I have had with Windows users: I'm sharing an apartment with a friend, Amir. We share a Rogers cable high-speed. He does P2P and has set a limit on bandwidth, so I don't have any problem with that. Once I found that I cannot download above 4kb/s from kernel.org, where I usually used to do at 70kb/s for the least. Turned out Amir has reinstalled Windows again, and have installed Gozilla to speed up downloading lots of applications he's got to install one more time. It took quite a while to make him understand how Gozilla is not going to make more bandwidth out of our cable, but simply eating my lunch by opening 20 connections instead of one. And the damn router doesn't have any traffic shaping capabilities. :( It's amazing how living without Windows makes words like "download accelerator", "spyware", "shareware", "antivirus", ... meaningless and unimportant. Richard Stallman writes in the FSF blog about his recent visit to Alhambra, Spain. Man, if you like that, you gotta visit the Persian gardens in Isfahan, Shiraz, and a few other cities. Traveling to Iran is a lot easier now (see here) Isfahan the Movie is an stunning short modeling of a mosque in Isfahan, in case you've not seen it before. I like the way RMS writes about his girlfriend too. That's what I like about RMS in general, he's always as young as he was in 1982. GUADEC 6 is a few hours and thousands of miles away. I missed it again for the third year. Every year I decide to make it this year and either somebody forgets to tell me about travel plans in time, or he thinks I'm not interested or busy or something... I'm acceping the first job offer that guarantees to send me to GUADEC 7 ;). Have a good time girls and guys, that should be quite a lot of fun. My old friend Siamak is staffing too. Instead, DDC'05 and OLS'05 in two months in Ottawa and I'm going to be there for the third year. I tend to like the week-long conference atmosphere. The three day GUADEC looks to short to me, but I've not been there, so you know. I like Ottawa the city too. Last year I take two hours off from the keyboard in the middle of the day and went for a visit to a couple museums. I particularly liked the Royal Canadian Mint. I collect Canadian quarter coins since. YAPC'05 (Yet Another Perl Conference) is next month here in downtown Toronto too. Some hundred bucks to register though. I may try to become a staff. Michelle dropped the idea of going there with Python tshirts. PAR<=>YYZ, the TORONTO photographs of Sam Javanrouh and PARIS photos of Titka Seddighi. Nice indeed. Sam's photoblog is one not to miss. Sleep Is For Dead People: 24 Hours of Live Art. Awesome. My Internet Tale: Hijab Movement in Iran, make sure you check the 20MB jpeg here. US trip was pretty good. Met lots of old and new friends, and Noah Levitt too. With the reopening of the Imam Khomeini airport in Tehran, finally the Iranian government decided to issue one-week visas to transit passengers in the airport. The details will be worked out soon. Good news for traveling monkeys that like Lebanon I guess. Unfortunately the news was not as controversial as the catastrophe that was the previous hit about this airport, so I cannot find an English article on it. Since Miguel moved and filled planet with all his posts ever, I go on and fill it with my new posts for a few minutes. Excuse me in advance.